Maroon Free People Dresses first surfaced on Chictopia's streetstyle gallery in Fall 2013 seen on Nashville blogger ModernDayCharm of moderndaycham.com. She wore her maroon free people dress with a charcoal gray Jeffrey Campbell boots and black H&M leggings. Since then, Maroon Free People Dresses have grown in popularity as bloggers from Knoxville, Los Angeles, and Nashville have discovered them. 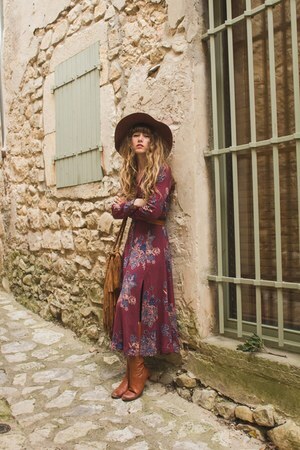 Maroon Free People Dresses are generally seen in bohemian, retro, and urban style. Popular types of Maroon Free People Dresses are beaded and lace. There are currently 7 streetstyle photos of bloggers wearing Maroon Free People Dresses.